A new twist on the game of Sorry! Introduced by Parker Brothers in 2008 as a new and improved version of the classic board game Sorry!, Sorry! 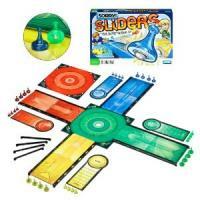 Sliders, is a quick paced game that puts a fun twist on the original favorite. The new take of the game is similar to shuffleboard as players slide their pawns down the track, scoring points or knocking other players' pawns out of the game. Recommended for players ages six years old and up, the game is a perfect choice for a family activity or when young friends get together. Since the game is easy to play and simple to understand, younger children should enjoy playing the game with older family members or with adult supervision. Although older children might get bored after playing the game repeatedly, Sorry! Sliders is a fun game for all ages. Playing an entire game only takes about ten minutes, making it a good choice for a quick paced game to play between other games. The game is for two to four players. Each player slides one of his four game slider pawns down the track, alternating turns until all the slider pawns are on the game score board. Once all of the players have finished sliding their game pieces down the ramp, each player moves a game scoring pawn up the score board the number of spaces written on the circles where the slider pawns landed. During game play, a player's sliding pawn can knock an opponent's sliding pawn into a different spot on the game score board. If a player's sliding pawn goes off a board corner, or just touches it, the player must then move his scoring pawn with the highest score back to the start position. The first player to have all of his scoring pawns reach home, wins the game. However, in order to win, the scoring pawns have to reach home by the exact number needed. Race for Home is the most basic of the four games and is played on the blue board. Instant Sorry! is played on the green board. Danger Dots is played on the red board. Playing Sorry! 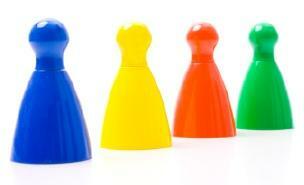 Sliders gives younger children practice with their numbers and develops counting skills. It also helps develop dexterity and fine motor skills. If you love playing games online, Sorry! Sliders is free at many different online game websites. The virtual version of the game is played in a similar to the actual game. As you play, the object of the game is to slide your virtual pawns into the home space or knock your opponant's pawns into the space marked "Sorry!". This fun shuffleboard like game is available to play for free at Electronic Arts (EA) and Xbox Live Marketplace Arcade.